A file photo of garment stitching factory. 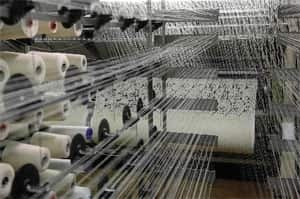 New Delhi: India’s factory output expanded at the slowest pace in two years in September, providing more evidence that growth in Asia’s third-largest economy is slumping more rapidly than earlier foreseen. Factory output grew 1.9% in September compared with 6.1% in the same month last year, data released by the Central Statistics Office (CSO) showed. Cumulatively for the first half of the current fiscal, the Index of Industrial Production (IIP) grew 5% against 8.2% in April-September last year. “The situation is very grim," senior Bharatiya Janata Party (BJP) leader and former Union finance minister Yashwant Sinha said at a press briefing. “Investor confidence and investment is down, and there is hardly any light at the end of the tunnel." The Reserve Bank of India (RBI) has raised interest rates 13 times since March 2010 to soften demand and douse inflation that has remained stubbornly high. In October, the central bank signalled that it would pause monetary tightening in December when its next policy meeting is due to take place. RBI deputy governor Subir Gokarn told reporters in New Delhi that India’s economy is expected to grow 7.5-7.6% in the current fiscal year ending 31 March. That compares with 8.5% growth in the last fiscal. Gokarn said the economy is clearly in a slowdown mode and the impact of rate hikes is visible on growth. Mint’s Asit ranjan Mishra says concerns are growing about the economy sliding at a faster pace than earlier anticipated. Planning Commission deputy chairman Montek Singh Ahluwalia discounted a connection between RBI’s rate increases and factory output data. “The (RBI policy) rate today is roughly what it was when the economy was growing at 9%," said Ahluwalia. When asked if he sees any prospect of interest rate cuts, he said the government has a robust mechanism to track that. Global factors are fuelling economic uncertainty, said Ahluwalia, adding that the Greek debt crisis has to ease for the uncertainty facing the world as a whole to diminish. Industry lobbies Federation of Indian Chambers of Commerce and Industry and the Confederation of Indian Industry urged RBI to reduce policy rates, citing the global economic deterioration. The Associated Chambers of Commerce and Industry of India called for a pause in interest rate hikes. C. Rangarajan, chairman of the Prime Minister’s economic advisory council and former RBI governor, said in Chennai that a reversal in the central bank’s monetary policy stance is likely by December-January, the time by which inflation should decline to 7% after topping 9% for nearly a year. RBI governor D. Subbarao said in an interview with Mint last month that it is not clear what would be the triggers and what would be the macroeconomic environment that would prompt a reversal of policy. “It will be a wrong inference that RBI will start cutting rates when inflation drops to 7%. Because we have said in the policy document that the long-term inflation should come down even below that. So 7% is not the threshold," he said. Citibank India economists Rohini Malkani and Anushka Shah said in a research note that the central bank’s policy stance after December would depend on inflation. “If the expected deceleration in inflation does not play out, risks of further monetary action, coupled with deteriorating global prospects and domestic policy issues, could add further downside risks to growth," they warned. While continued weakness in industrial production data could add downside risks to their industry growth estimate of 6.5% for the current fiscal, these may be offset by higher agricultural growth, supporting Citibank’s forecast of 7.6% growth in the gross domestic product (GDP) in the current fiscal, Malkani and Shah said. “Going forward, recessionary global conditions, coupled with domestic factors, including the lagged impact of tightening and sluggish reform progress, are likely to result in FY13 GDP coming in a tad lower at 7.5%," they wrote. In September, the manufacturing sector with a 76% weight in IIP rose only 2.1% and the mining sector contracted by 5.6%. The electricity sector grew robustly by 9%. Volatility in the capital goods segment continued, with the sector contracting 6.8%. Production in eight of the 22 industry groups in the manufacturing sector such as textiles, apparel, chemicals, rubber, machinery and equipment, and furniture contracted in September. While production of intermediate goods grew 1.5% in September, output of consumer goods slowed to 3.5% growth from 9.7% a year earlier mainly because of a contraction in the production of consumer non-durables (1.3%). 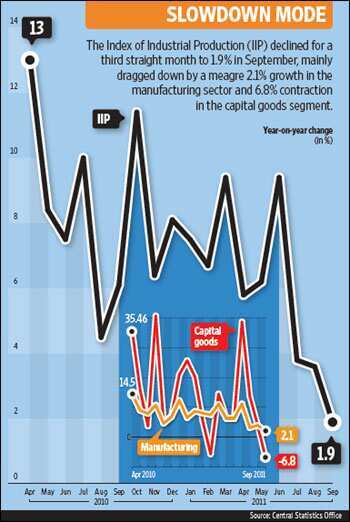 Capital goods output rose 3.9%, down from a revised 13.7% in July. CSO revised the June IIP up to 9.45% from 8.8%. However, it reduced the growth estimate for August to 3.6% from the earlier provisional estimate of 4.1%. BJP’s Sinha said Prime Minister Manmohan Singh had shown little concern about the economic slump. The main opposition party will demand a discussion on the state of the economy in both Houses of Parliament in the winter session that starts later this month, he said. Ruhi Tewari, Prashant K. Nanda and Remya Nair contributed to this story.